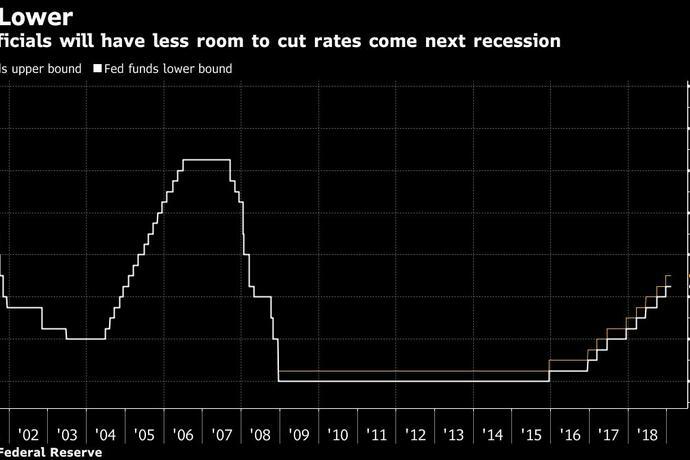 (Bloomberg) -- The Federal Reserve's recent turn toward patience on further rate hikes underlines an unfortunate reality: the central bank will have way less ammunition to fight the next recession than it had in the past. 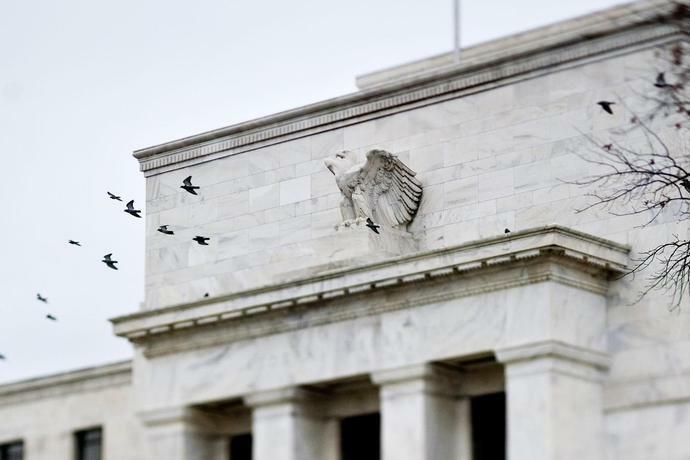 "The apparent change in monetary policy strategy led some observers to ask whether the Fed is overreacting to recent market volatility," Tiffany Wilding at Pacific Investment Management Co. LLC wrote in a blog post. "Many Fed officials now see a good chance that the current range of the fed funds rate (2.25 percent to 2.5 percent) is the terminal level of this cycle -- a level notably lower than most of them had previously expected." Yet the fact that interest rates are likely to linger at a stopping point well below the historical norm -- whether that's the current setting or slightly higher -- means that the central bank will have less room to ease policy to boost growth. Against that backdrop, the Fed plans to spend 2019 talking about its future policy framework. San Francisco Fed President Mary Daly suggested last week that the central bank might contemplate using bond buying as a more regular tool, not one solely reserved for when interest rates are at zero. Pimco's Wilding suggests that average inflation targeting -- basically letting prices run a little higher when the economy is strong -- could also be on the menu. That's an idea often raised by New York Fed President John Williams. Also worth watching? Whether the Fed actually thinks they're done for the cycle. Speakers so far seem divided -- many are reserving judgment. Policy maker's next Summary of Economic Projections, scheduled for release March 20, could give us a more comprehensive clue. Canada's Monetary Policy Report: If Text Could Speak, What Would It Say? The Bank of Canada's Monetary Policy Report is getting easier to read, researchers at the central bank find using textual analysis. They look at the report from 1995 to 2018, and conclude that readability varies by governor and the documents have, on average, been slightly more complicated than an average Canadian could be expected to understand. Under Mark Carney, who now heads the Bank of England, complexity increased -- but the gap with the average Canadian's reading level has fallen to its lowest on record under current Governor Stephen Poloz. In fact, the typical person could now understand the text. As young adults increasingly live with their parents, they're spending less. Adult children who move out of their parents' home spend about $13,000 more annually than their counterparts who don't, based on this Fed analysis, with about half of that due to increased housing and utility expenses. That's important on aggregate, because some 3.25 million extra young adults are living with their parents now than if pre-recession trends had prevailed. If they all moved out and spent like their out-of-the-nest peers (probably an unrealistic assumption), it could boost spending by $40 billion, or 0.3 percent of overall consumption spending. That said, "the increased saving rates among young adults living at home might lead them to be better prepared for the financing of future household purchases, their children's educations, or their retirement." The former Republican presidential candidate says he intends to keep a promise he made to President Donald Trump to serve on central bank&apos;s board.